EB Acoustics is probably not a name that many in the music-technology world will be familiar with. I've always been impressed by the performance of Fostex's PM-series monitors, especially given their entry-level pricing, but the majority of the ones I've looked at have been two-way systems. HK have turbo-charged their compact line-array system with new dual-driver subs and double-height tops. Have the improvements been worthwhile? It's not often that I take a look at drum microphone kits, so I was interested to have the opportunity to try out this LD Systems set from Adam Hall. Tobias Lindell set himself the difficult task of recreating the sound of his own high-end compressor in a much more affordable box. Did he succeed? Like some classic broadcast mics, these new MXL models are designed for spoken word, but turn in a good performance on instruments, too. Even Neve themselves make several variations on the classic 1073 theme. What makes this one different? With systems getting ever cheaper, there's never been a better time to explore personal monitor mixing. Here's our selection of current options! Do you like a slice of glitch with your hop? Prime Loops certainly do, having launched this download pack. There's more to loudness than meets the ear — and after years of research, TC know more about that than most. Some of London's top session players were present at the recording of The London Sessions, which took place at Soho's Dean Street Studio. Reason has plenty of tricks up its sleeve for adding character and warmth to a mix. Read more about Freq Out! Despite the immense power and flexibility available in modern DAW software, many people still find that the mixes they craft entirely 'in the box' sound unsatisfying. Why is that? How do you make a mix gel when some of the tracks arrive already drenched in effects? That's just one of the challenges our mix engineer takes on this month. Discover Reaper's powerful Screensets feature for faster editing. Simple and sophisticated sampling are both on offer with Live's Simpler and Sampler instruments. Spruce up your soundstage with DP8's new Ensemble Chorus and Spatial Maximizer plug-ins. This month we discuss Rudimental, Calvin Harris, Taylor Swift and our Classic mix track is 'If I Don't Care' by The Inkspots. Jamie Cullum's sixth studio album, Momentum, sees the British pianist and singer further expanding his stylistic palette. Hey man, nobody ever asks me about this stuff. I love talking about it, so thank you,” exclaims J. Cole. Years before the Minimoog appeared, a Finnish visionary was already building digital polyphonic synthesizers — and they were controlled by light, skin conductivity and even brainwaves. This months we comment on albums from Teenage China, 87PM, Christopher Libertino, The Emergency, Fingers & Thumbs, The Gluespots, Yoshiko Ohara and Marvin B Naylor. Sounding Off: Why So Few Women In Audio? Why are there so few women in record production and sound engineering? An audio technology graduate offers her view. Read more about Sounding Off: Why So Few Women In Audio? Q. Is there a simple way to play a VST instrument without a DAW? Read more about Q. Is there a simple way to play a VST instrument without a DAW? Q. What's the best setup for processing while recording? Read more about Q. What's the best setup for processing while recording? Q. Which types of pickup are available for guitar? Read more about Q. Which types of pickup are available for guitar? Not many companies can claim responsibility for creating an entirely new market sector, but that is certainly an accolade that is due to Argosy Consoles. Mark Knopfler's British Grove studio complex is one of very few large studios in the world to have been constructed in recent years. Anyone who plays or records music on a professional level will have a lot of money invested in instruments, studio equipment, premises and so on, while even a humble home studio can contain many thousands of pounds' worth of gear. Recent NSA wiretap transcripts have uncovered a transatlantic telephone conversation which could have disastrous consequences. 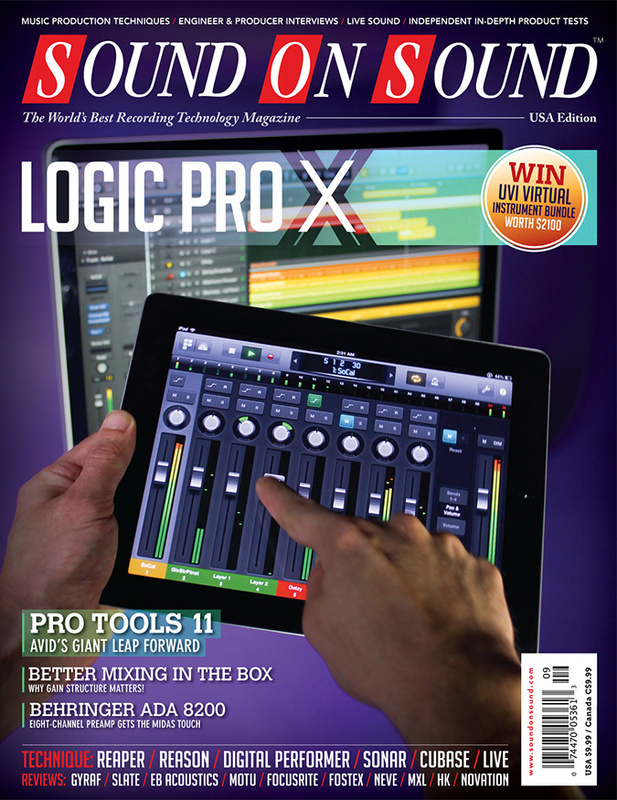 Media content for the September 2013 issue.